While on holiday in Cornwall this summer I managed to get a parking space in Padstow on the quayside which is a near miracle at that time of the year. As I strolled past Rick Stein’s fish restaurant my brass band detector radar went off as I noticed several ‘banders’ walking in the same direction. At first, I thought they were in a carnival as they were wearing different coloured waistcoats, but after being my usual nosey self and asking I discovered they were a local brass band. 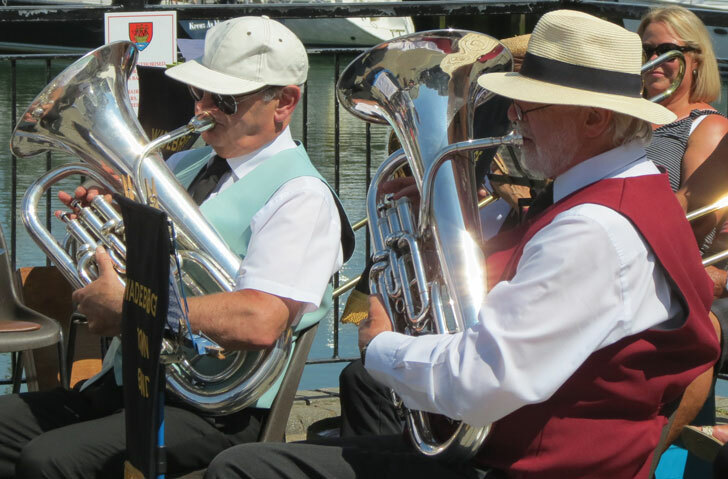 Wadebridge Town band is non-contesting band located in North Cornwall and have been around in their recent format since 2002 when the mayor of Wadebridge and now band Chairman set about reforming the then defunct band. The band has been in existence for over 100 years although the exact origin of its roots are not known. The Great war of 1914-18 thinned the ranks of the band, however, there were still enough players available to compete in the famous Bugle Contest in Cornwall in 1919 and 1923 under the baton of Mr. W. Lobb. In those early days, nearly every reasonably large Town had a choir and brass band as technological distractions like X-Boxes and other modern gadgets and distractions were in the far distant future. 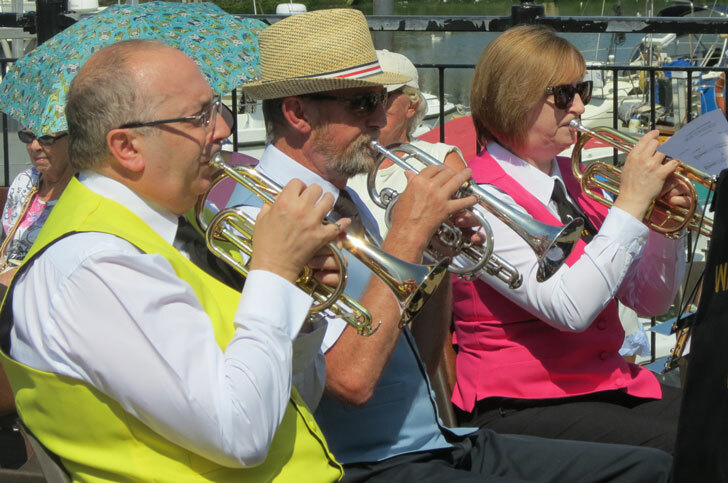 There was a true community spirit and the band would have been well supported and probably not lacking people wanting to play a brass instrument. Back in those halcyon days transport and communications meant that players were mainly from the local town so everyone would have known each other outside banding, unlike today where players globetrot to attend rehearsals! 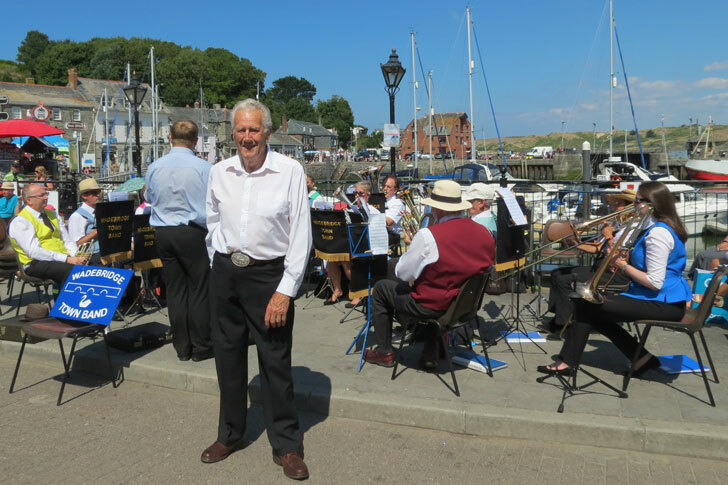 The band prospered in the 1930s under the baton of Harry Roberts and in the 1940s becomes a feeder and supporting band for the local Bodmin and Minver Bands. The baton was passed to Mr. W. A. Mills who kept the trophy cabinet well stocked with silverware before handing over to the ex-band sergeant of the Devon and Cornwall Infantry Mr. R. Dawes. 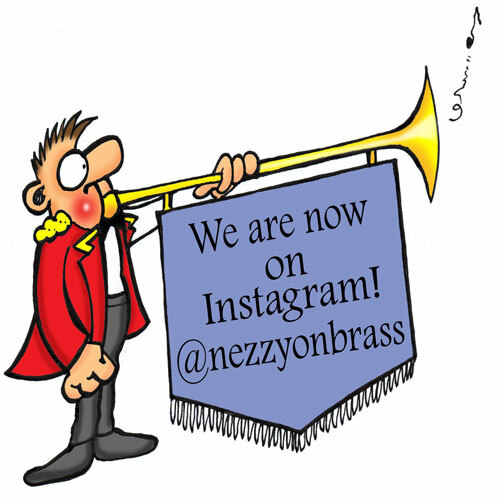 During the 1050s the band had several successes in local contests and some of the younger members of the band also made it into the National Youth Brass Band. A youth band was set up by David Blake and his son Phillip around 1962. Unfortunately, the band fell into decline in the mid-’60s with most of the instruments being disposed of. It wasn’t too long before the Phoenix rose out of the ashes and Phillip Harris put the band back on the map in the 1970s. The band made a television debut on the Children’s favourite show at that time ‘Multi-Coloured Swap Shop’ in the local Egloshayle playing fields. This must have been huge for the band at that time as the TV Program was a national treasure for kids in the late 70’s early 80’s. For those of you who are of that age – Noel Edmunds, John Craven, Keith Chegwin and Maggie Philbin were the hosts with their mascot a stuffed dinosaur called ‘Posh Paws’ (actually spelled Pohs Paws – i.e ‘Swap Shop’ in reverse )…I digress! The baton was shared between several conductors in the early ’80s with Phil, Jack Wills, Lionel Boundy, and Keith Babbs directing the band. In 1985 the band went to the wall once more and all instruments were passed to the local St. Johns Ambulance band for community use. Eric Gill, Band Chairman – possibly the oldest brass band collector at 90 years old I have ever seen! – He certainly looks a lot younger – must be the magic of Cornish pasties! 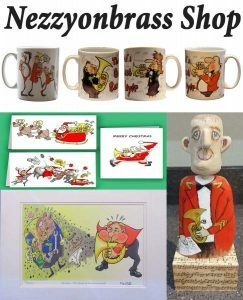 I spoke to Eric Gill the band’s Chairman who was out in front of the band with the collection bucket – not bad for a chairman in his 90’s! 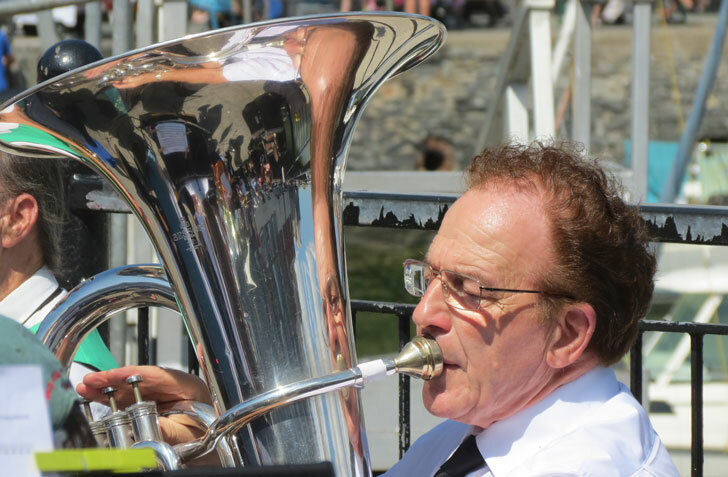 He told me that during his tenure as the Mayor of Wadebridge in 2002 he felt that the band should be reformed to celebrate the Queens Golden Jubilee. Thanks to his resolve and determination the Wadebridge Pheonix once again rose out of the ashes and the present day Wadebridge Town Band was established. Since then the band has prospered as a non-competing band entertaining local folks and holidaymakers in and around Wadebridge. In that first couple of years the band was guided by Mr. M Bennett, then Keith Babbs before Nick Chadd took over in 2005. 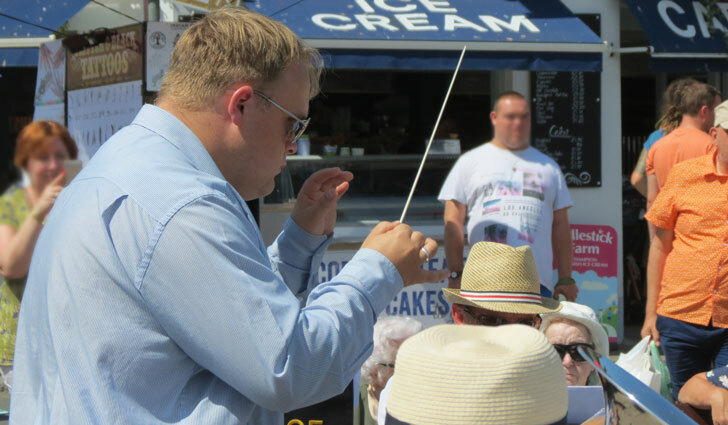 The band improved rapidly under his direction and then there was a short break in which the band were ‘conductorless’ before the present musical director Peter Meanwell took over the helm. The one thing that struck me about the band is their multi-colored waistcoats! Had Noel Edmunds continued to influence the band long after their TV appearance back in 1978? The band manager, Chris Parsons, informs me that local bands think its funny that they don’t wear all the same colored uniform. However, I thought it makes the band really stand for what they do – entertain! 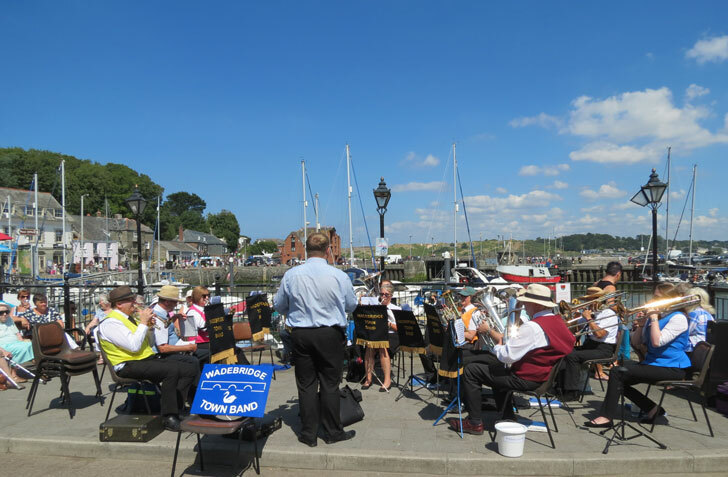 On an extremely hot summers day in Padstow, this colourful musical band of dedicated bands folk added to the sheer joy of being on holiday. 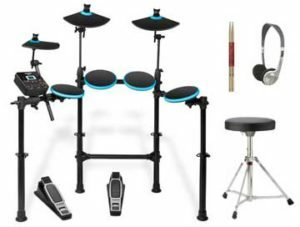 Wadebridge does not have their own dedicated band room and rehearse around different venues in the town and currently hire Wadebridge Churchill Bars function room for practice. I have never been in in a band without a band room. It must be a logistical nightmare particularly for the band’s library, percussion, uniforms and the rest of the paraphernalia that goes with banding! They also have a junior band appropriately called the Cygnets as the Towns shield which is unofficially their coat of arms, has a white swan on it. 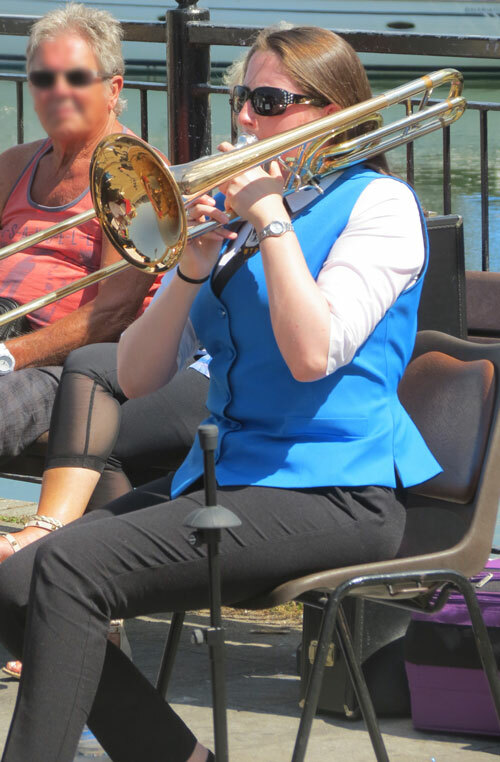 The junior band is always on the lookout for new members so if you have a child or a young relative who would like to learn how to play a brass instrument in the Wadebridge area – pop along and see the band on a Friday Evening or contact the band below. 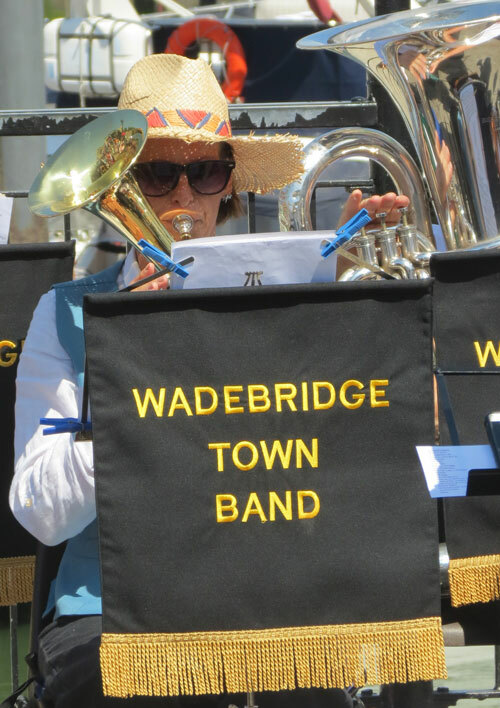 Although it has been a chequered history with many ups and downs thankfully Wadebridge Town Band has survived to entertain and put a smile of the faces of Cornish folk and hoardes of holidaymakers alike. There is nothing better on a hot summers day than devouring a Cornish ice cream while listening to one of the most colourfull bands in the country…and long may it continue! 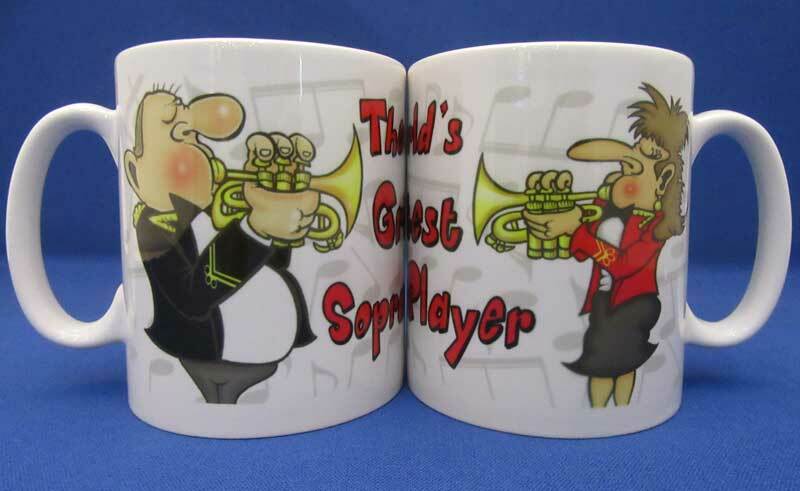 Gifts Ideas for Brass Band Players – Cartoon Mugs	Brass band Quiz 15 – How well do you know brass banding Christmas ?